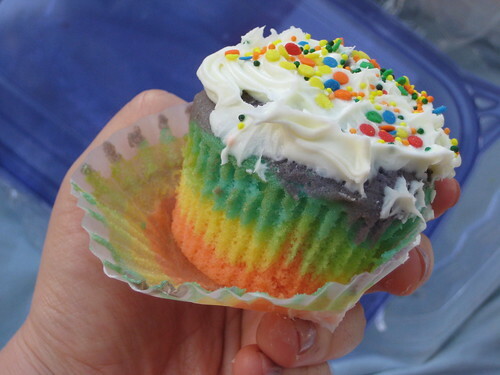 A Cure for the Mondays: RAINBOW CUPCAKES!!! Possibly the greatest thing you'll see this week/decade. I recently turned 25. So far being a quarter-century old has been pretty awesome. With every bite, they get prettier. 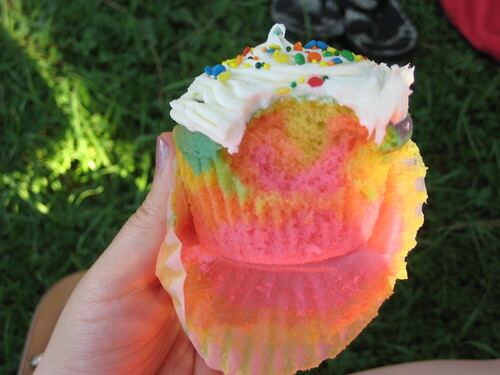 There’s something psychedelic about these cupcakes… like a lava lamp, or a tie-dyed T-shirt. I love that even the wrappers were rainbow-fied. Can you see the happy face? 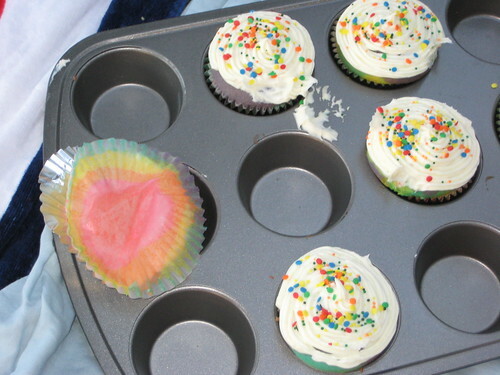 That was my 2nd cupcake… I only ate two. Like a big girl. Each one had a different swirl/color pattern. And though I’m not a fan of posting my own picture on here, I had to show you this… photo (and idea) by Sam. 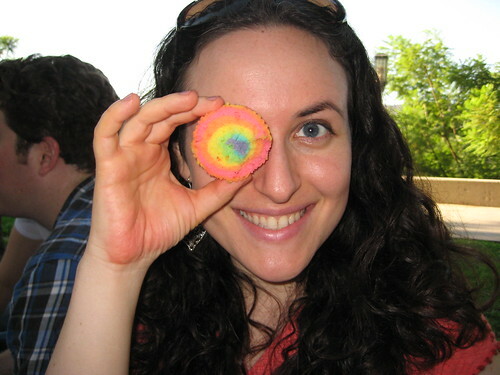 Amazing rainbow technicolor cupcake eye! In case you’re wondering HOW Whitney achieved this– first of all, she works in production design. AKA, she’s professionally creative and crafty. 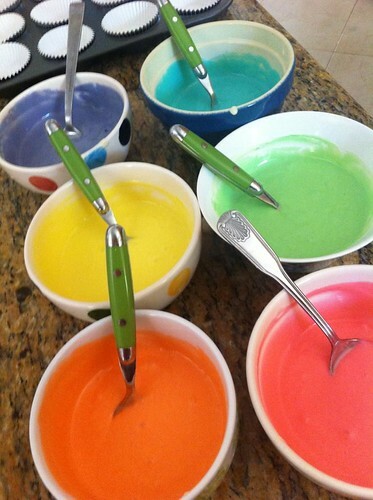 Technical specs-wise– she used vanilla cake mix, gel food coloring, and Funfetti frosting. 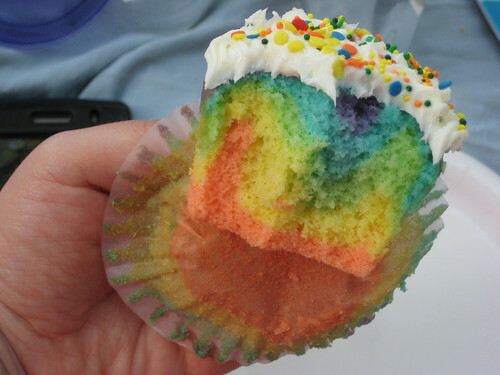 I’ve seen a rainbow cake before, but never a rainbow cupcake! Life-changing! I can now go forth into the world as a full-blown 25-year-old. Can I frame a cupcake wrapper? Is that crazy-pants? The best part? I still have two left in my refrigerator. 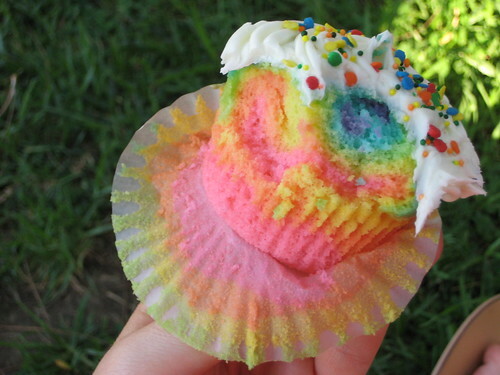 Shall I have a rainbow cupcake for breakfast? When I was, like, 11 years old, if you had told me that when I turned 25 I’d be living in LA, working in TV and eating rainbow cupcakes for breakfast– I think I would have been pretty pumped. I shouldn’t be so hard on myself. That 11-year-old would totally think I’ve made it in life. Time to retire! Actually– time to go to work. possibly the prettiest food i have ever seen. too bad you can’t preserve and frame the actual half-eaten cupcake. that’s what a picture does, more or less. You know how much I love rainbows. ‘Nough said.